San Michele in Borgo is a church in Pisa, Tuscany, Italy. The church, together with monastery (which first belonged to the Benedictines, and, from the 12th century, the Camaldolese) was built in the late 10th to early 11th century outside the walls of the city, over an ancient temple dedicated to Mars. Both were restored several times in the following ages. The facade is from the 14th century. The upper part has three order of typically Pisane Gothic loggias. There are three portals, also in Gothic style and withlunettes; the main one is surmounted by a tabernacle with "Madonna and Child" by Lupo di Francesco (the original is in the city's Museum of St Matthew). The solemn interior, with a nave and two aisles, houses a Crucifix attributed to Nino Pisano (14th century), paintings by Matteo Rosselli, Baccio Lomi, Aurelio Lomi and Giuseppe Melani, as well as remains of frescoes from the 13th century. Under the pavement is the crypt, probably what remains of a former church. 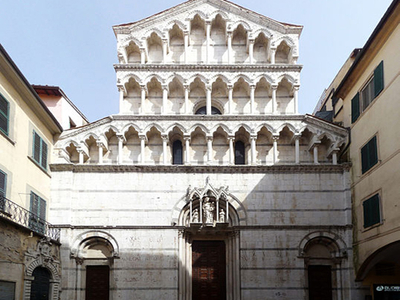 Here's the our members favorite photos of "Churches in Pisa". Upload your photo of San Michele in Borgo!